I’ve made no bones about why I hated advertising while I was a copywriter and, later, an associate creative director in countless agencies. Well, I didn’t hate it all 18 years that I worked in the industry, but toward the end, it was mind-bendingly painful. (Have you ever gotten to that point in your career where you fantasized about carrying around sharp objects praying someone got into an argument with you?) During meetings, all I could think about was being in my kitchen baking. What ameliorated the interminable idiocy of creative dingbats and cowardly account people was I got to bring in my perfectly baked goods for all to enjoy. At least that gave me some satisfaction. And nowadays it’s rare when I see a print ad or TV commercial that makes me think, “I wish I had done that.” That exactly what happened when I saw the ads for the 2009 Sydney International Food Festival, created by WHYBIN/TBWA. Although ads without copy are the bane of most writers with a healthy ego—after all, we have to pee on the ad somehow to mark our creative territory—I would’ve been quite content to have nary a word of mine of them. They’re brilliant. They instantly communicate the message: foods of the world, in an extremely clever way. (And I don’t mean that in the condescending way a creative director says: “Oh, David, that’s sooooooo clever.”) Each flag from a participating country is made up of ingredients indigenous to that country. 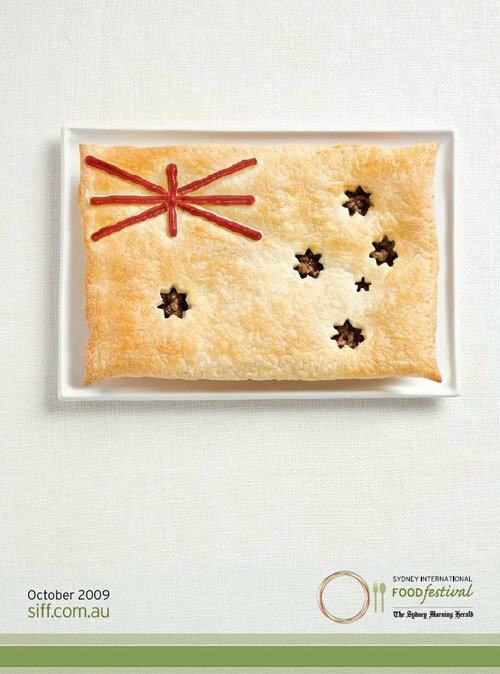 Here, host nation Australia has its flag made from a big ole minced meat pie with star cutouts and ketchup stripes. Click to see the rest of the flags in the campaign. The ads also gentle poke fun at the viewer because, at least for me, I didn’t recognize every flag or know every ingredient used to make them, so it reminded me that I could learn a thing or two from this festival. And speaking of festivals, I’m sure this campaign will be seen in the upcoming awards festival season. I got to admit, it’s almost enough to make me get nostalgic and haul out my portfolio. But sorry, mad men, I’ve got an apple pie with streusel topping with my name on it going in the oven any minute. The flags are delicious. I didn’t see a US version. It must not be one of the participating countries. Perhaps you could have a small contest to see who can come up with the best US flag. Think of the possibilities: The red stripes could be either a row of hot dogs or a row of lobsters. Steve, I love that idea. Folks, here are rules: Design your own U.S. flag in the manner of those created for the Sydney International Food Festival, submit a picture to us, and we’ll pick a winner on Dec. 1, 2009. We’ll feature the winning photo on LC, and the artiste will receive a $100 gift certificate to Williams-Sonoma. NOW, Steve, it’s incumbent on you to send in the first entry. David, I felt that way after a little over a year in marketing and advertising. I am so thankful I’m not alive in the days of working your entire life in one company and career. That much said, home baked goods helped to calm the nerves and disrupt the tedium, and foreshadow better times with all the focus on food. Phew.